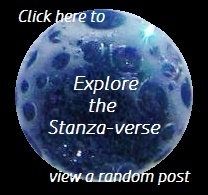 love | What Rhymes with Stanza? Brilliant stars kiss the sky. Fevered ocean steams. I picture amore’s caramel eyes, and listen for secret embrace. Cheating dog, so long. Velvet smoke almost gone. Somber, I will heal, then fly.